Tonight I went to the two-hour freshman orientation for my daughter. It was, maybe, the last orientation I’ll ever attend as she is my youngest and parents don’t usually go to college orientation. I suppose my next orientation gig will be when they show me around the nursing home my kids pick for me. Oh I hope it has a coffee bar. Anyway, I digress. It was an incredibly boring event, but, as you might expect, there were some things that I found interesting. Here are some of the highlights. 1. The dress code continues to be ridiculous. My daughter still can’t wear bandanas to school. She was told by one of the teachers, “If we don’t like your hairpin, we will physically yank it out of your hair.” This school is filled with dress code Nazis. I’m serious. The rule book even spells out that it is a violation to wear anything with a skull and crossbones. So no Pirates of the Caribbean t-shirts. Oh, and I guess they can’t read my excellent short story, Jolly Rogers. 2. 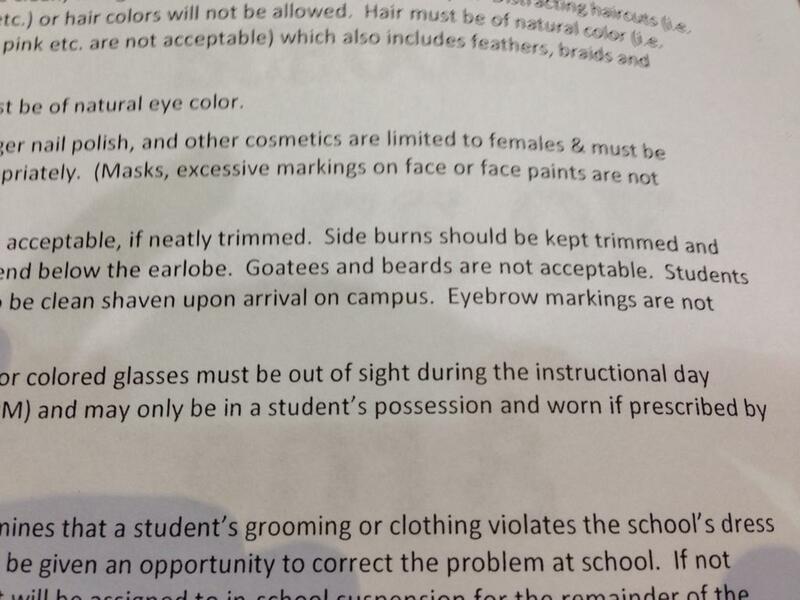 Speaking of dress codes, the rule specifically spells out that boys may not have beards. They can have a moustache, but no beard. Not even a goatee. Now, as a bearded man I find this offensive. If a 16 or 17 year old boy, working to fill adequate about his manhood is able to grow a beard, he should be allowed to. Not only allowed, but it should be applauded and encouraged. A beard is not deviant behavior. 3. The funniest moment for me came about an hour into the program. The principal had just given a passionate speech about how the high school had put wifi in all the buildings, was sparing no expenses in spending new bond money for updated technology, and that every student would be given an iPad. Then, not two heartbeats later, the cafeteria director stood up and informed everyone that if a kid got more than $10 behind on his lunch bill, he or she would only be given a cheese sandwich and a glass of water for lunch, with the implication that Bruiser and Killer would be by the house later to collect. How screwed up is that? We’ll give them an iPad, but not lunch. The world is so weird. 4. File this under “Hashtag sarcasm.” Right before the principal gave this great speech about technology and streaming it seamlessly into the classroom he informed us that students were only allowed to use their cell phones if a teacher allowed it. Again, the irony is delicious. We give them iPads, but restrict their cell usage. Oh, by the way, you can follow all the administration and counselors on Twitter, but apparently you can’t tweet them at school. 5. I just can’t let this go. All the talk about embracing technology was reinforced with constant encouragements to visit the schools internet link for student information. We can check grades, print transcripts, see absences and do so many wonderful things. The system is called Skyward and just about every school in North America uses it. Come on people, why not go ahead and name it what it really wants to be–SKYNET, with complete control of everything. 6. The school really cares if an athlete is falling behind on his grades, because an athlete is not eligible to play if he or she fails and some of the coaches are on board with this. No mention was made if the school cared if a non-athlete fell behind in grades. 7. The students don’t know their schedule yet and can’t find out. So, freshmen are showing up the first day of school with, literally, no clue where to go. They have to find their name on a big board that tells them which room to go to. Then, in that room, they will get their schedule. Now, that is the first time they see their schedule, on the first day. They may have gotten the classes they wanted, or they might not have. Sorry, though, schedules can’t be changed. Literally, a student is stuck with the luck of the draw on the first day for the whole year. The whole year. That is messed up. So those were the highlights. Makes me very glad that I went to high school at a sane institution, run by people who loved to teach children, at a time when a teenager could actually be a teenager. Man I miss the 80s. They could probably request that she take her hairpin out first. You know, using their words. This schedule thing seems like they are purposefully trying to make the first day as stressful as they possibly can. Free ipads with wifi but forbidden cell phones tells me whoever came up with that plan doesn’t actually know how technology works. And caring more about technology than food is just how the world works right now. Still screwed up, but not surprising. joan–i mumbled the same thing to the parent beside me at orientation (i know, it is hard for you to imagine me mumbling and grumbling) about the irony of no cell phone/emphasis upon technology. the principal went on and on about how the school was going to teach these students how to use emerging technologies, when the reality is the students probably should teach the teachers and administrators. my daughters have a much firmer grasp of how all this stuff works than i do. thanks for reading and commenting joan! Is this a public school? When I was in private school a long time ago, we were not allowed to have facial hair of any kind, but that was a preparatory school, and boys also had to keep their hair short all the time and wear a jacket and tie or a jacket and turtleneck among other formal requirements. The local public school I attended briefly had a rule against bandanas that the principal claimed was a hygiene issue. I understand rules have shifted around in different communities over the years in public schools since my youth, although I have no children of my own and no other cause to worry about school dress codes. I always thought public school was where a kid should pretty much be able to look as his parents permitted him as long as he didn’t wear anything obscene, defamatory, or otherwise legitimately dangerous. virgl, believe it or not, it is a public school. the private school down the road has an even stricter regulation that these, as it requires uniforms. ironically, i am not against uniforms in the public school, but i am against arbitrary, seemingly out-dated dress code rules. they are draconian here about almost everything in the school district. on the school bus, for example, students have to sit male/male and female/female. i thought that was very odd. this particular district is know in the area as the strictest and (stupidest) when it comes to dress code issues.